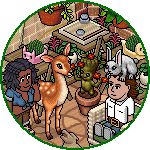 Easter Garden was the 2017 Easter campaign and furniture range on Habbo. The campaign began in March when the new furniture was added to the hotel. Older Easter furniture also reappeared in the catalogue under Easter Comeback. The furniture line was inspired by the garden during Springtime, focusing mainly on conservatories rather than the outdoors. New Rares, Crafting items and Room Bundles were also released throughout the month. 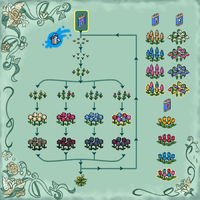 Habbos could plant seeds and water them using the Watering Can effect. Each seed would grow into one of four coloured plants and could be watered multiple times to change colour. Watering them too many times would make them turn into a Grubby Weed. The seeds were only available by buying a Room Bundle (see below) but could be traded or bought from the Marketplace. Three rares were available to be purchased during the campaign, including the Butterfly Habberge Egg. During the campaign the Easter Garden Bundle, Easter Treehouse Bundle and Enchanted Forest Bundle were released. The Chicken Coop Bundle was re-released.